In the period between the Mauryas and Guptas lot of wealth and energy were spent on Buddhist architecture and one of their major symbol was the stupa. 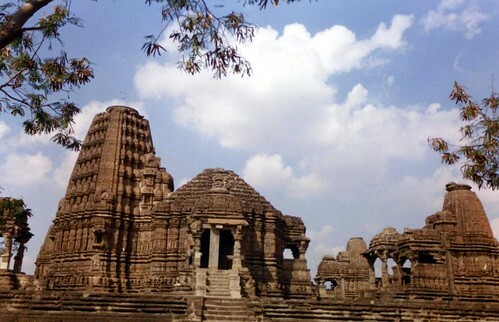 The main sites of Buddhist stupas are Bharhut and Sanchi in Madhya Pradesh and Amaravati in Andhra Pradesh. During the period of the decline of Buddhism, this stupa was also neglected and it was burried under rubble. There is a 14th century inscription in Sri Lanka which mentions repairs made to the stupa and after that it was forgotten. If the early history of Amaravati and its stupa is dramatic and intriguing, its chance re-discovery by the archaeologists is more so. Around the year 1796, an enterprising zamindar shifted his residence from crowded Chintapalli to deserted Amaravati. He soon invited other people to settle in Amaravati. This led to the construction of roads and houses in the area. In the course of construction, the workers often found large bricks and carved limestone slabs below the ground. The news soon reached the ears of Colonel Colin Mackenzie, who visited the site twice (in 1787 and 1818) and prepared drawings and sketches of the relics in the area. Eventually, several European scholars like Sir Walter Smith, Robert Sewell, James Burgess and Alexander Rea excavated the site and unearthed many sculptures that once adorned the stupa. In recent decades, the Archaeological Survey of India has conducted further excavations in the area. The Amravati school of art had great influence on art in Sri Lanka and South-East Asia as products from here were carried to those countries. It also had influence over South Indian sculpture. The Government Museum at Egmore (Madras Museum), one of the oldest and largest museums in Asia hosts the “Amaravati Gallery”. Apparently the design for the Indian Parliament was “inspired”. The inspiration comes from an eighth century Shiva temple in Madhya Pradesh. Located in the non-descript Mitawali village of Morena district, the magnificent circular structure lies in a radius of 170 feet. The temple, dedicated to Hindu God, Lord Shiva, has figurines of 64 demigoddesses engraved on the circular inner wall. It also has 64 rooms, each with a ‘Shivlingam’- Shiva’s phallic symbol. Archaeologists claim that the temple was a seat of Vedic and astrological studies in the olden days. The Parliament building, designed by renowned architects Sir Edwin Lutyens and Sir Herbert Baker, was constructed in 1927, 20 years before India’s independence in 1947. The building has been highly appreciated for its design across the world .It is touted to be among one of the world’s best architectural wonders. But the temple, which the archaeologists and locals in Mitawali believe might have inspired the magnificent building, is in a state of dilapidation. From the end of the Gupta period in India, religion in India was more into magic and sexual mysticism. This affected even Buddhism and a new branch called Vajrayana appeared in Eastern India in the 8th century and grew in Bihar and Bengal. A version of this branch, modified by local cults and practices was established in Tibet as a result of missions sent from India. The monastery responsible for this was the Vikramasila, in Bihar. The ruins of this monastery is located a few miles away from Bargaon village, where Nalanda University was located. The Tibetan Taranatha’s description in his work, History of Indian Buddhism, in the early 18th century and other minor historiographical works and from references in the colophons of a number manuscripts recovered from Tibet elaborate Vikramasila was the greatest and most famous educational establishment of the time. This university was located on the right bank of the Ganges where the holy river flows northwards. It was in the Augustan period of Buddhist Pala kings of Bengal Vikramasila emerged the pre-eminent position in the contemporary educational structure of the then India. This stately educational establishment had six noble gates, each of which was guarded by a scholar Buddhist monk officer of the university designated ‘Gate-keeper Scholar’ (Dvarapalaka Pandit) who examined applicants to the university. It is said that these entry examinations were so tough that of ten applicants only three gained admission. The university granted the degree of Pandit, equivalent now to Master of Arts. The Palas, the last major dynasty to champion Buddhism were responsible for the revival of Nalanda University and the massive building programme at Somapura, which is now in Paharpur in Bangladesh. Pakistan has many places of worship important to Hindus and Sikhs and we covered on such place, Sharada Thirtha, a while back. Now Pakistan is nominating the Katasraj temple, dedicated to Lord Shiva, for World Heritage Site status. Dedicated to Lord Shiva, the sprawling Katasraj shrine located in Chakwal district is constructed on a site believed to have been visited by the Pandava brothers of Mahabharata epic fame. Apart from the temples, there is a sacred pool having mythical association with Lord Shiva. During their exile the Pandavas reached a lake and when they were about to quench their thirst, a Yaksha, the protector of the lake appeared and said that only people who answer his questions right would be allowed to drink water. The four Pandavas failed and were made lifeless by the Yaksha. Finally Yudhishtira answered all his questions and the brothers were revived. According to one legend, this dialogue happened at the Katasraj Mandir pond. A look at this temple and you can see how much renovation and restoration needs to be done here. Now Pakistan is going to spend $25 million for the restoration of this temple and hopefully after that it should have the grandeur it once had. Often, Indian Hindus and Sikhs make demands to Pakistani authorities to give them permission to visit their holy places located in Pakistan. These visits allow the visitors to worship in those places and also see for themselves how temples and gurudwaras are maintained in the Islamic state. One such holy place, the Sharada temple, according to Subhash Kak, is the most famous and sacred of all Kashmiri pilgrimage centers. It is located in Neelam valley in Pakistan occupied Kashmir near the Line Of Control. According to Al-Biruni Sharada was as important as Somnath, Multan and Thaneshvar. The native script for Kashmiri is also called Sharada and was derived from Brahmi. The earliest records in Sharada have been dated to 800 A.D and was found all over northwest India. Also, Gurmukhi, the Punjabi script was based on Sharada script. None of the history books, even ones by eminent historians do not mention this script or temple. A mention of the Sharada temple is present in the second volume of Rajatarangini, translated by M.A.Stein. Recently someone traveled to Pakistan Occupied Kashmir and sent a detailed report on the journey as well as the state of the temple. Looking at the pictures, you can see for yourself how well the Pakistani Army has maintained the temple. Well, atleast they did not blow it up like what the Taliban did to the Bamiyan Buddhas. After looking around I could not find who built the temple or what era it was built. If you have any information/links, please let me know. Lahore, Pakistan, was founded by Loh (Lav), the son of Lord Rama and there is a temple in Lahore fort dedicated to him. After being closed for many years, the dungeons of Lahore fort and the temple are going to be opened for public.